What is a Corporate Minutes? 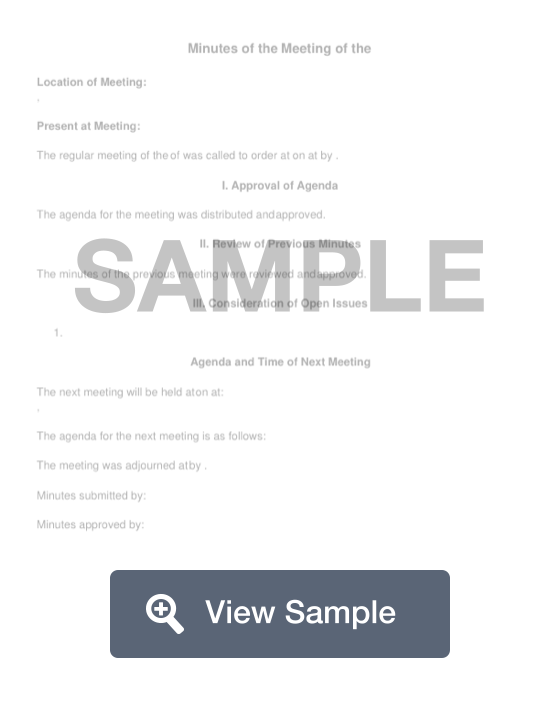 A corporate minutes form is a template used during meetings to document what happens during that time. It is an official record that is required for most not-for-profit organizations as well as for limited liability organizations. This form helps you document the date and time of the meeting, where the meeting took place, the purpose for the meeting, and the results of the meeting. It also documents the name of the person responsible for keeping the minutes. Corporate minutes are used to record the minutes spent in corporate or professional meetings. These minutes need to be recorded in order for a corporation to retain their legal status. This is especially true of non-profit or limited liability status organizations. Having an official record of these corporate minutes will ensure that your organization is following the law and can keep the special corporate status. A corporate minutes document should list information about the meeting. This will include the date and time of the meeting, where it was held, and what the purpose of the meeting was. The outcome of the meeting can be included if necessary. The name and information for the person who is completing form should also be included for record-keeping purposes. Any corporate minutes document should be kept in the business’ records for as long as they are in operation. When should you use a corporate minutes template? You should use a corporate minutes template is you are required to prepare a written summary of the items that were discussed at your meeting and the actions that were taken at a meeting of shareholders or board of directors. Most states require all S Corporations and C Corporations to keep records of major business decisions and major meetings that are held. Currently, the states that do not require meeting minutes to be kept are: Delaware, Kansas, Nevada, North Dakota, and Oklahoma. Companies that are formed as LLCs are not required to keep minutes. Create a free Corporate Minutes in minutes with our professional document builder. What transactions or resolutions might you need to record? What should you do with minutes after they are recorded? Meeting minutes should be kept with your other important corporate documents, such as your bylaws, resolutions, and articles of incorporation. All of these documents should be kept for a minimum of seven years. Members of the corporation are entitled to review the meeting minutes upon “reasonable request” to the corporation. It is not necessary to file meeting minutes with the state. Why and how do you maintain a corporate minutes book? You maintain a corporate minute book in order to keep clear records on any action that has been taken by your company. Over time, you may be asked to provide evidence that the company approved certain actions. Your law firm may need to look to corporate records when they are responding to due diligence requests or working on a legal opinion. Most states require corporations to keep meeting minutes, so these records are important to maintaining your corporation’s good standing and limited liability status. Meeting Details - Write down the full name of your company, date and time of meeting, and location of meeting. Attendance - Write down who attends. Note any members who are absent. Note anyone who arrives late or anyone who leaves early. Note who is running the meeting and whether a quorum was present. Meeting Purpose - Record the purpose for the meeting: annual shareholders or directors meeting, hiring new employees, discussing new compensation, announcing new officers, issuance of stock, discussing financial activity. Acceptance of Prior Minutes - After a meeting, you should distribute the minutes to the other members for approval. The first item on the agenda of a meeting is generally to accept the minutes from the previous meeting. If anyone objects, note the objection. If you must make revisions, not the change. Discussion Notes - Summarize the discussion about the agenda items. Note any documents that the attendees are reviewing. Attach a copy of the document to the minutes. Record Votes - If any votes are held, you must record the results. Adjournment - Note time of adjournment and time and date of next meeting. Store Approved Minutes - Store the approved minutes with your other important corporate documents.